Leaving Robecq on the 2nd November the division marched to the Somme. The route taken was by Auchelle—Monchy Breton—Averdoing-Rebreuviette —Barly—Montrelet—Harponville to Albert, which was reached on the 19th November. Throughout this 90-mile march, though the weight carried by each man was between 70 and 80 lb., and the distances covered were considerable, not a man of the Bucks Battalion fell out, a record of the march discipline that had been instilled into the men, and it may be added, a tribute to the personality of the Battalion Medical Officer, Captain J. E. S. Wilson, who seemed to possess the power of persuading a tired man that fatigue was an illusion, and of stimulating him to fresh exertion. At Albert for the first time the two Bucks Battalions met, the 1/1st being in the line near the Butte de Warlen­court. During the subsequent operations on the Somme, only one Division lay between the 48th and 61st Divisions in the line. On the 21st November, the 61st Division relieved the 18th, the 184th Brigade relieving the 55th, the Bucks Battalion being in Brigade reserve at Ovillers, where they remained till they moved up to the Mouquet Farm right subsection in relief of the 2/5th Gloucester's on the 26th. 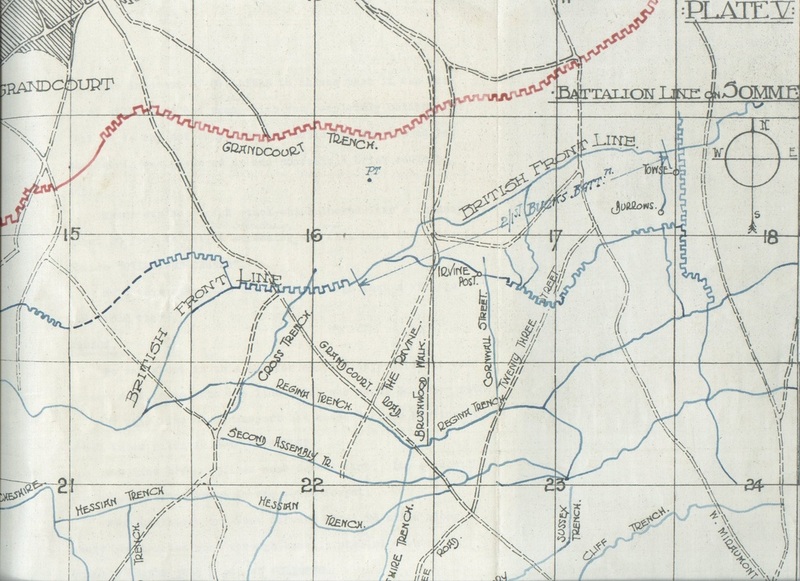 On the 30th the Brigade went into Divisional reserve, the Battalion moving to Martinsart Wood, and thence to Hedauville, where they spent a week training. On the 11th December, Captain and Adjutant G. E. W. Bowyer left to be attached to the staff of the Division, and Second Lieutenant T. S. Markham was appointed to act as Adjutant in his place. On the 12th the Battalion moved up to Martinsart, and were employed on many and various fatigues till the 20th, when they moved to Wellington Huts via Aveluy in support, with “A” Company in Fabeck Trench, and on the 24th went into the line Desire Trench. This trench, which had recently been captured from the enemy, lay at the bottom of the valley, some 500 yards in advance of Regina and Second Assembly Trenches, and were all commanded from the German position at Grandcourt on the opposite rise, so that all movements by day were clearly visible. The trenches and approaches were deep in mud, and inter-Company reliefs were often delayed by the difficulty of finding the way, and the weather seemed to get worse and worse every day. Despite the wet and mud the Battalion managed to spend a cheery Christmas Day. Mesnil-Domqueur. At Gappennes they were accommodated in huts and barns, and underwent training in very cold and frosty weather till the 3rd February, when orders were received to move to the neighbourhood of Ablaincourt. Marching by Villers, where a halt of eight days allowed training to be continued, they entrained on the 13th at Longpre for Marcelcave, and thence marched via Wiencourt Camp to Framerville, and on the 16th February relieved the 1st Battalion of the 124th French Regiment in Deniecourt northern subsection. When first taken over, in a slight frost, the trenches seemed to compare more than favourably with anything that the Battalion had so far seen in that line. They were narrow and deep, well supplied with serviceable dugouts, and beautifully duck-boarded. But when the frost disappeared the total absence of revetting allowed the whole to collapse rapidly, and the rain that followed the thaw turned every trench into a holding morass of knee-deep slime.